Tom and I have promised ourselves that we would not buy any more cookbooks. We have a bookshelf full of cookbooks that we love, but it got to a point a few months ago when we both thought.. this is getting a little ridiculous.. there are only so many meals you can make in one lifetime! 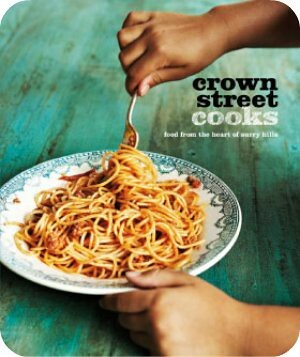 However, I might have to make an exception for this cookbook that came out last week, because Crown Street Public School was my primary school and this book looks great.. full of simple, yummy, family recipes. Crown Street Public was an awesome primary school. The whole school did half an hour of Tai Chi every morning before class started. Of course, at the time it was the most embarrassing thing ever, but now I think its totally cool. 20 odd years ago Surry Hills was no where near as trendy as it is today, but it was still a very cool place to grow up. My dad had this huge warehouse on Campbell Street, that was just behind Crown Street Public School. My dad is an architect and the warehouse was his office, but being a typical Dutchman (who can't live without his morning coffee or three) he decided to put a coffee machine and some big tables in the front of the warehouse, so that when clients came in they could all sit down and look over the plans with a real cup of coffee. The only entrance to the warehouse was a huge roller shutter with no sign. One day a guy who was walking past popped his head in to ask if it was a cafe.. my dad said no, but come in anyway because he makes a pretty damn good cup of coffee. (If you knew my dad, that would not seem weird at all). To cut a long story short, 6 months later my dad had given up architecture all together and was running a cafe full time that saw 3000 people through the doors every week. All the drawing boards had been replaced with tables. A kitchen had been built and a pool table added. My dad parked his 2 vintage 1969 convertibles in the back of the warehouse and there was live jazz most nights. . and so Sanctuary Studio Cafe was born! I would walk down every afternoon after school and I have such great memories of hanging out there all afternoon, playing pool and taking orders. It really was the best thing ever because my dad had no intention at all of opening a cafe.. it just happened and he went along with it. Unfortunately, just before the Sydney 2000 Olympics the whole block- 4 huge warehouses were all bought and pulled down to make way for 800 hideous apartments (no offence if you live at 186 Campbell Street, Surry Hills) and that was the end of an era. My dad spent some time looking for a new venue, but never managed to find a place that was just right.. and warehouses like that just don't exist anymore. So my dad went back into architecture. But still to this day, almost anywhere my dad goes, he will have someone stop and ask "where is the new sanctuary?" This is such a delightful story. I was enthralled! I love the story of your childhood and your Dad. What a shame his warehouse went, I hate those ugly apartments. Warehouse cafe sounds much more exciting. The pirate and the skipping rope..